Bruce County's 150th anniversary is in 2017 and the historical society is celebrating by launching a documentary covering over 150 years of history. For more details go to the Bruce County Heritage Documentary Project page.. The Bruce County Historical Society, with the assistance of the Bruce County Museum, is compiling information on the armed forces members and veterans of Bruce County. For more details go the Bruce County Military Project page. The Bruce County Historical Society is photographing all of the barns in Bruce County because they are disappearing at a staggering rate. Barns form an important part of the history of the county and we want to preserve images and information for future generations. For more details go to the Bruce County Barn Project page. Bruce County was named for James Bruce, 8th Earl of Elgin and 12th Earl of Kincardine, who was Governor General of the Province of Canada from 1847 to 1854. The 19 member Bruce County Council. This photo was taken between 1896 and 1924. 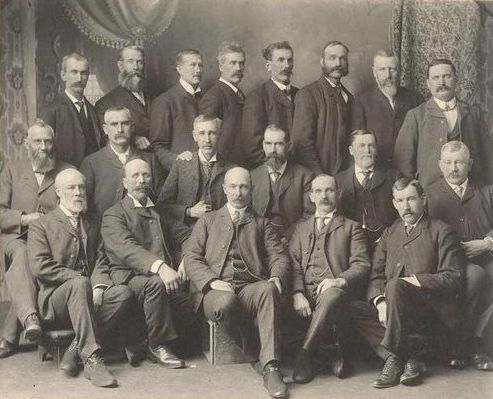 The only identified person is county treasurer Norman Robertson, front row left. Municipalities within the County of Bruce prior to the 1998 amalgamation. See the links page for the names of the new municipalities. See links to Lake Huron charts on the maps page. Also see the links page. Copyright © 2002 - 2017 Bruce County Historical Society. All Rights Reserved.